This is a just a just a software with which you call international and local calls its a cool software it just require a installation and account which can be made through this software . 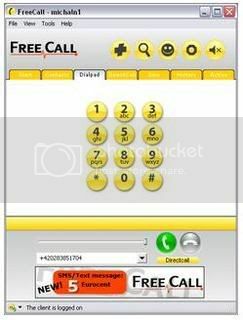 Using this VOIP program, you can call landline numbers in any country for FREE. FreeCall is still a Freeware app but you only get 300 minutes a week. Keep the setup.exe. Freecall’s protection system is quite flawed, when the program announces you cannot use any more minutes = Uninstall and reinstall and it will reset your 300 minutes which only takes a moment. B)Go to the dial pad TAB, ignore the on screen buttons, at the bottom type in your number and remember you need to add country codes at the beginning - NO spaces in the number either. C) And it does do all countries for free - i’ve used it from NZ to england, USA, Spain and Aussie and they used it back. D) If it didn’t work, you need to check your firewall settings etc, this is an obvious but a program like this needs full access.